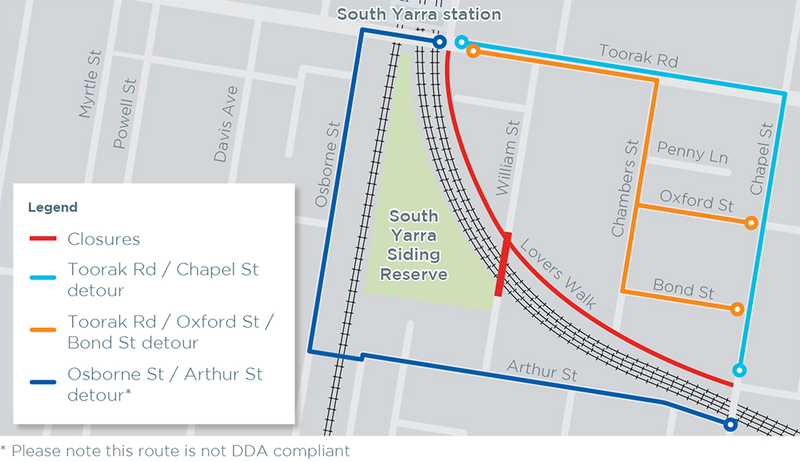 Due to drainage investigations, Yarra Street will be closed to all traffic from from 8pm to 5am, Wednesday 1 May to Friday 3 May. Detours will be in place during this time, as per map below. Works to upgrade traffic and pedestrian signals at the intersection of Chapel and Arthur Street are required to improve truck, traffic and pedestrian safety around work sites within South Yarra. Due to this upgrade, Arthur Street will then be intermittently reduced to a single lane between Monday, 11 March and the end of May 2019. William, Oxford and Bond streets will be closed to through traffic, and parking removed, from Friday, 5 April until Thursday, 24 April to support the safe movement of trucks, pedestrians and other vehicles while major works are carried out. Local access will be maintained by traffic controllers. Works at the eastern tunnel entrance will require the demolition and rebuilding of the William Street bridge to accommodate a widened rail corridor underneath. Williams Street bridge closed on 15 October 2018 and will reopen in 2022. The height of the rebuilt bridge will increase to pass over the top of the reconfigured Cranbourne / Pakenham line. Proposed construction traffic routes have been developed for the eastern tunnel entrance precinct that focus on moving trucks and other construction traffic to Toorak Road as quickly as possible. Active traffic management will also be used to minimise delays to tram movements and traffic flow along Toorak Road. A number of rail corridor occupations (periods where trains stop running so works can take place) will be required to connect the Metro Tunnel to the Cranbourne/Pakenham line. These occupations will potentially disrupt services on parts of the rail network. Our construction contractors will be required to develop and implement measures to minimise disruption to the transport network during construction of the Metro Tunnel.